Are you 100% dazzled by who and what you are right now? How about 90%? How about being a little more you? If you want to have a fabulous life, and be the best version of yourself, you’re going to need a plan. You’ll have to do a little work. Stand up, start now. Be more than a beige, autopilot adaptation. 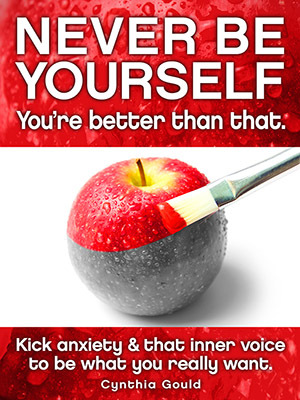 Learn how to change, lie to your brain, and rewire your personality to become a more authentic, real you. You can be more outgoing and confident in this awkward, panic inducing world. You can kick that low level anxiety holding you back. You just have to think about it, work at it, and have a plan. The two secret tools are sheer bloody-mindedness and a notebook. Only you know what your goals are. Who do you want to be, and what do you want to do? Whether you want to be a completely different person, get promoted, find new friends, or just upgrade your life in general, this book can help you get started. There are many Action Items (aka “Homework”) to set you on the path to find the best you, and a simple formula to follow to get it done. Even if you have never read a self-help book in your life, why not give it a shot? Trying new things keeps us interesting… if you’re into that sort of thing. Warning: Contains salty language, science, psychology, snarky humour, and Canadian spellings.